Born of two architects, I was taught from an early age to see and to absorb beauty, light, color, texture and form and to converse adeptly with these elements to bring design into real forms, both artistic and for practical use. Design as a language became second nature, like breathing. While my parents worked, I took it all in. Sandra Davis Lakeman showed me by example how to approach creativity with a sense of adventure and ferocity and it is no wonder that she became a professor emeritus of architecture. I celebrate her life of professional, academic and creative achievement. She continues to live a productive life of creativity, travel, and photography where she documents the built and unbuilt forms of human history. My father, Richard Lakeman, envisioned, orchestrated and made real places and spaces of impossible beauty, order and balance and he created a legacy of buildings and urban planning that will live on in the Pacific Northwest as lasting embodiments of his sophisticated design principles and philosophy. I celebrate my father's life of lifelong learning. Throughout my education, I have excelled in the arts and have made a lifetime study of creating and of making things. So it made perfect sense that in my early 20's I joined the Art & Design program at California Polytechnic State University in San Luis Obispo where I studied with a diverse, fiercely rigorous and experienced group of leaders in the field of design. My education was broad because my interests were broad, as they remain today. A curious mind is never bored. Graphic Design and Ceramic Arts were my two loves at Cal Poly. My passion for creating art extends to fiber arts, ceramic arts, jewelry making, drawing, painting and travel journaling. My design philosophy marries the client's goals with a passion for bringing everyday communication materials to life. My design career began in Portland, not surprisingly in an architecture firm, supporting architects in the pursuit of presentation and marketing. There I learned about the computer, about working with teams of people and about time management. Simultaneously, I got my feet wet in print graphic design by volunteering to create materials for the American Institute of Architects Portland chapter, as well as designing an ornament for President Clinton's Christmas trees. It hung among hundreds of architects renditions on the multitude of trees in the White House. 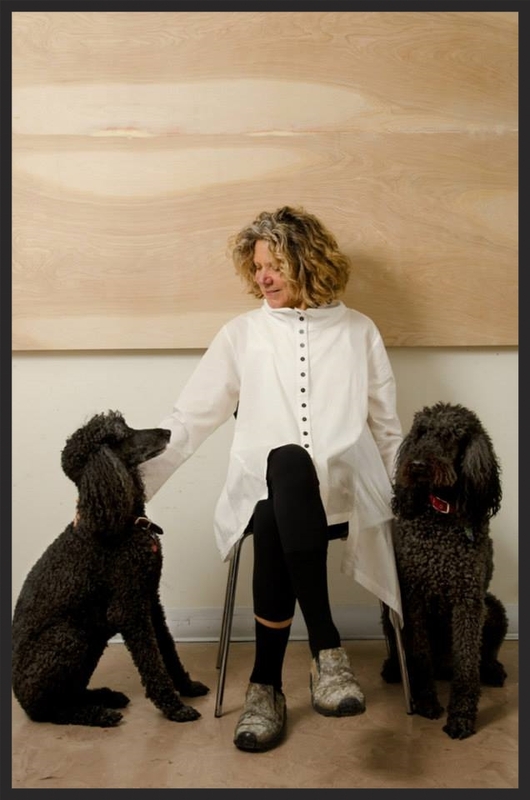 Seattle was home to Gehl Design, a small and poignant design firm headed up by the talented and business savvy Joyce Gehl, educated in Illustration at Pasadena's Art Center. She mentored me in the art of design as craft. Every detail to be perfected in the design, presentation, production and fabrication. She modeled the art of design in every respect. She stressed excellence, concept and execution. Her passionate interest in her clients, being largely small local businesses and non profits modeled for me a true sense of caring for the client and for the outcome of their individual projects and long term successes. We reached into the depths, we were efficient, we completed our work with time to spare, we delivered work people loved. I became entangled in a love affair with color, texture, atmosphere, typography, transparency and composition. Each layout a masterpiece. Our work was recognized by Print, How, and Communication Arts Magazines. Identity package for Alice Pagliari, and her Alice Springs Ranch, New Cuyama, CA. Complete with new logos, business card, letterhead, envelope and notecard which doubles as a directions card. • All around artist. Graphic designer, writer, illustrator, ceramicist, jewelry maker, painter, knitter. Providing strategic design services for businesses and non profit organizations and specializing in logo and identity development, print design, annual reports and design for social media and the web. The approach is thoughtful, collaborative and in-depth and culminates in inspired design with effective results. The focus is on listening to the client and helping them achieve their goals. The work is crafted and all aspects of the process are held to the highest standard of creativity and overall excellence. Traditional methods of design, as well as the most current technology are utilized. Intensive research and strong concepts based on a thorough understanding of the client’s story, brand, objectives and product inform the design. This process yields the most appropriate and successful solutions. Abilities blossomed with the mentorship of Joyce Gehl. Her focus on non profit and small and local businesses provided fertile learning grounds, grew into the role of senior designer and handled client projects from start to finish, served as creative director and lead designer, as well as attended to production. Worked directly with clients, presented ideas and stewarded jobs to their completion. Worked with vendors and attended presschecks for jobs as small as business cards and as large as complex annual reports. Contributed to the team with an intelligent and intuitive approach and enjoyed the team work atmosphere. These years were expansive and multi-disciplinary. Contributed to the creative pool and supported lead designers on identity, collateral and annual report projects. Supported marketing efforts and collaborated with project lead architects to create presentation graphics and marketing documents. Provided design services for the Portland Chapter of the AIA. Design projects for the AIA included invitations, posters and an elaborate 3D ornament for President Clinton’s White House Christmas trees.